Welcome to Resources for Seniors, Inc.
Resources for Seniors serves older adults and adults with disabilities in Wake County, NC, by providing home and community-based services and information so that they can maximize their choices for independence, comfort, safety, security and well-being. We provide information and support for decision-making, and also direct services such as home care, adult day care, senior centers, home repair, and more. We are committed to excellence in service and care for individuals and their families. 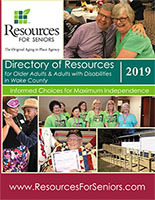 The 2019 Directory of Resources for Older Adults and Adults with Disabilities is here! Print copies of the new edition are now available at our main office. A PDF copy can be downloaded right now from our Directory page. Spanish and Korean versions of the 2016 directory are also available. All serious inquiries are invited. Please see detailed requirements in the documents linked below. 919.872.7933 © 2009, Resources for Seniors, Inc.